I originally bought The Cardigans's first two albums on CD when they were released in the '90s, and for a while they were the soundtrack to my life as I commuted to work in London. For some reason I never followed the band after Life (1995)... and if I'm being totally honest, I wasn't even aware they'd released more albums. Although, I do remember 'Lovefool' being released as a single. 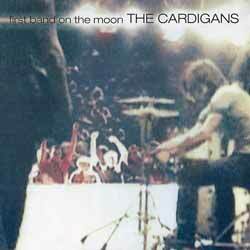 First Band on the Moon (1996) is The Cardigan's third album. While it's still a strong indie pop offering, it's not as novel as the previous releases. Nina Persson's vocal's are starting to mellow a little. While her child-like singing is still front and centre, there's a little more maturity that shines through. The album contains 11 tracks (39 min), with highlights including 'Been It'; 'Never Recover'; 'Lovefool'; and 'The Great Divide'. Sadly there are a few too instantly forgettable numbers: 'Heartbreaker'; 'Happy Meal'; and 'Losers'.